I love a good transferred epithet. I spent a restless night. I hauled my embarrassed bikini out of the cupboard. It’s happy hour. They say a lot about my life. But Hubby will tell you that’s all lies and propaganda. Certainly, this summer has been a scorcher. I have the rings under my eyes and the dopy look to prove it – chilled cider has been my only ‘salvation’. Frankly (my Chinese neighbour’s favourite phrase is ‘to be frank’), I’m relieved. I’m relieved that Sir E and Lady H’s allotment is being watered – not by my priming the borehole pump to fill a 10l watering can 15 times over the course of an hour – but by the heavens themselves. I’m relieved that tonight I will surely find cool, calm sleep. I’m relieved to be sipping a hot cup of tea while watching the rain outside. I’m relieved I didn’t get caught in the downpour. Talking about thirsty weather, last week I heard the sad news that the fires in South Africa last month completely destroyed a beautiful eco lodge called Phantom Forest. Phantom Forest is a cluster of tree houses, high up in the forests of the Knysna Heads. It’s just you and … the monkeys, mozzies, butterflies, birds and various other mites and beasts. Hubby still regales (to anyone who will listen) the story of how he protected me from a prowling Vervet monkey who he thought had got into our room, but which in actual fact was staring menacingly at us through the glass and pacing along our balcony. The photo above of the red flower, was posted by Phantom Forest following some recent rain in the area. So, to all the moaners, humph-ers, “It’s always raining”-ers and “typical English weather”-ers … let’s just try and take a moment to be grateful. P.p.s. 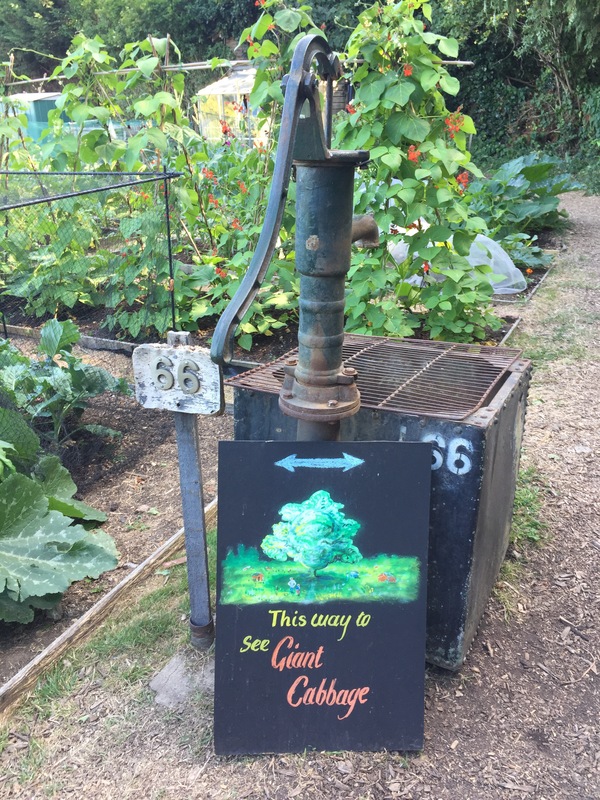 Despite following the sign, we did not find the giant cabbage. P.p.p.s. Last year, you may remember, I did get caught in the rain.